The index opened flat to positive and stayed in a narrow range oscillating around the dotted line but closed just in red at 8774.65, loss of 11.55 points. The broader market was weak with 555 advances to 1071 declines. Range stays at 8500-9000. Call option 8800-9300 added 9.13 lacs OI with short covering at 8700 and below strike prices. Put option 8700-8500, 8300-8100 added 8.33 lacs OI with profit booking at 8400 strike price. 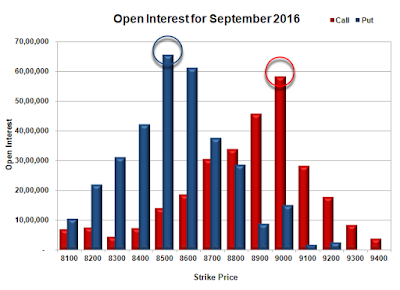 Nifty Open Interest is at 3,36,25,125 up by 6,01,275, with decrease in price, probably short build-up. 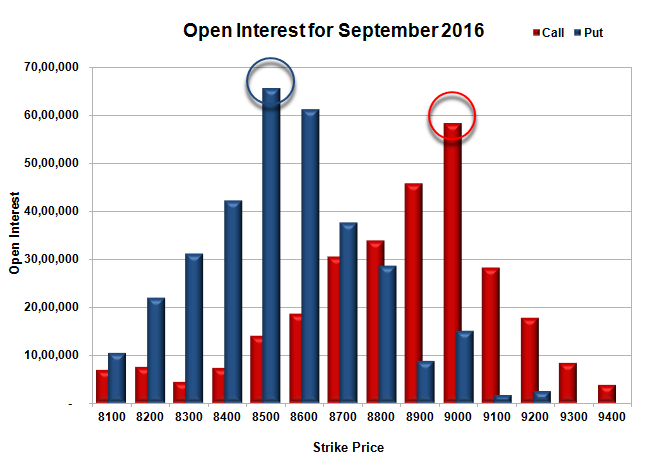 Bank Nifty Open Interest is at 29,05,320 up by 79,560, with no change in price, probably long/short build-up. 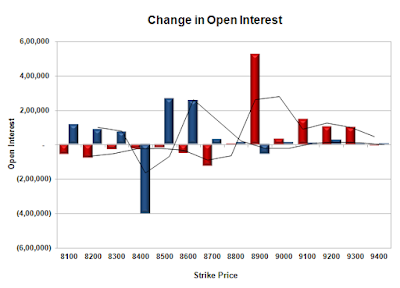 FII’s bought 6053 contracts of Index Futures, which includes net 11655 contracts long build-up and 5602 contracts short build-up, with increase in net OI by 17257 contracts, includes 29942 longs to 23889 shorts for the day. FII’s Index future open contract as on date is 400791 Longs to 40776 Shorts, Net long 360015 contracts. Initial support at 8700, with OI of 37.66 lacs and below that at 8600 with OI of 61.21 lacs. Initial resistance at 8800, with OI of 33.84 lacs and above that at 8900 with OI of 45.85 lacs. 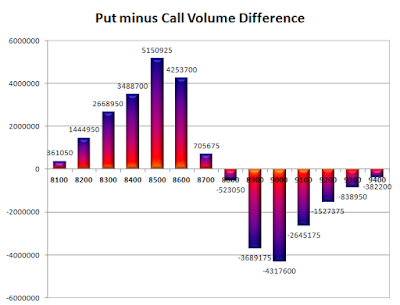 Day Range as per Option Table is 8721 - 8839 and as per VIX is 8713 - 8836 with 8783 as the Pivot.